This is one case where you should always read the first book in the series first! The Enemy Next Door and Other Misunderstandings is actually the second book in this series. The author told me that…but I forgot. Don’t make the same mistake. Make sure to read The Glamorous Life of a Mediocre House Wife first! Quite honestly, I understood what was happening, but things would have made more sense if I had read the other first. Jocelyn is a great main character. She’s always trying to help someone else. And she has an adorable daughter, Katie. I loved the scenes with these two together. They’ve been on their own for a while and they bring out the best in each other. I loved them! Jocelyn is not a perfect character, she’s always ruining something she’s cooking. That made me like her even more! And then there’s the way she treats Cade. She’s not overly nice to him. Cade isn’t nice to Jocelyn either. Both of them had some prejudices toward each other due to Jocelyn’s ex-husband Nate. It was interesting to me how Nate had prejudiced Cade towards her. And how she perceived some of the things that Nate had done as having been started by Cade. I loved seeing the plot through both characters eyes. That helped me to see that neither of them was as bad as the other thought they were. This one has tons of mysterious things going on. There’s a murder, plus all the stuff that had happened to Jocelyn’s neighborhood in the first book. And those things appear to be somehow connected. I loved the way Cade and Jocelyn figure out how to work together and figure things out. There’s plenty of suspense and even a bit of romance to keep everyone interested! Make sure to read this great series! I loved everything about it. 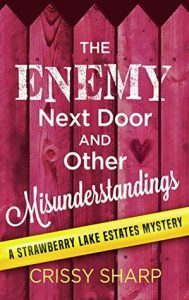 I was sent an e-copy of The Enemy Next Door and Other Misunderstandings. All opinions are my own.